Dharma is a concept of central importance in philosophy and religion. It has multiple meanings. It is difficult to provide a single concise definition for Dharma, as the word has a long and varied history. There is no equivalent single word translation for Dharma in English language. Yog Sadhan Ashram is offering a workshop on the topic of Dharma on Saturday, April 2 from 10:00 AM to 1:00 PM. A simple, vegetarian lunch will be provided. The workshop will be conducted by Acharya Hersh Ji, the Director of Yog Sadhan Ashram. In this retreat, we will cover in detail the definition, meaning and types of Dharma. Please come with questions. Register: Please email YogSadhanAshramUSA@gmail.com to reserve your spot. Cost: $35 suggested minimum donation, however, no one will be turned away from lack of funds. YSA is a 501(c)3 organization, and donations are deductible to the extent allowed by law. 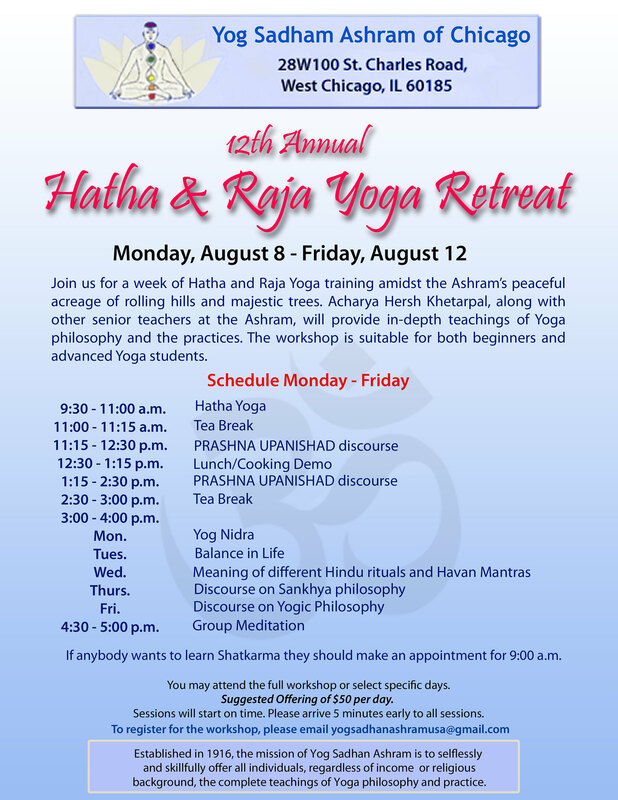 Join us for a week of Hatha and Raja Yoga training amidst the Ashram’s peaceful acreage of rolling hills and majestic trees. Acharya Hersh Khetarpal, along with other senior teachers at the Ashram, will provide in-depth teachings of Yoga philosophy and the practices. The workshop is suitable for both beginners and advanced Yoga students. Suggested Offering of $50 per day. No one will be turned away for lack of funds. YSA is a 501(c)3 and all donations are tax deductible to the extent allowed by law. Sessions will start on time. Please arrive 5 minutes early to all sessions. To register for the workshop, please email yogsadhanashramusa@gmail.com. Workshop Description: This hands-on workshop will first explain the anatomy and movements of the shoulders. Students will then be taken through a series of asanas particularly suited to improve the range of motion and strengthen the shoulders. Common issues and pain felt in the shoulders will be addressed as well, and students will have the opportunity to discuss any particular issues they’re currently encountering related to their shoulders. Teacher: Neeta Mohanty is a certified yoga instructor and is especially experienced in therapeutic yoga.